When setting up the marine aquarium the hobbyist is beginning a journey to a beautiful world that most people in their lifetime will not see. 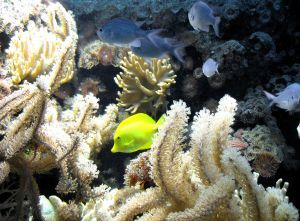 It is an opportunity to view the wonders of the corals reefs right in your own home. The coral reefs are a delicate eco-system and as such great care must be taken when setting up an environment to house a small portion of this eco-system. It is the goal of this article to equip the marine hobbyist with the necessary knowledge to setup a beautiful thriving reef. The first step to setting up any tank is to determine budget. Reef aquariums can get really expensive really fast, a “fish only with live rock” (FOWLR) system will be less expensive than a reef but still quite expensive. When talking about the initial planning stages, it is very important to determine which form of filtration will be used. There seems to be a general consensus among marine hobbyists that the Natural Method for filtration is the best. The Natural Method is simply the use of live rock and a deep sand bed (possibly a refugium as well) to provide all of the biological filtration for the system and detritivores for physical filtration. The purchase of live rock will greatly increase the cost of you aquarium so you need to plan accordingly. Some conservative estimates put the cost of setup at right around $20-$25 per gallon for setup costs. The rest of the equipment decisions you need to make all deserve their own separate discussion. The tank is probably the most basic piece of equipment you will purchase, yet selecting the correct tank is a very important step. There are an almost endless number of different tank configurations available today so knowing which is best can be a bit daunting. There are those aquariums that while they may provide wonderful opportunities for aquascaping, they may not meet the need for the desired fish. Each tank shape has its strength in aquascaping style; aquascaping style will be discussed later. Corner tanks provide a great opportunity for aquascaping but severely limit the kind of fish that can be kept due to a lack of swimming room. If you like the look of a bow-front tank you will love the look of a reef in a bow-front. The bow-front tank provides a great view of your fish and looks great at the same time. The beauty of a bow-front tank is that you get all the advantages of a rectangle tank with a nice convex viewing area. No matter what configuration you choose, a pre-drilled tank is highly recommended so that a sump can be employed. A pre-drilled tank will have a given number of bulkheads based on the size of the tank. The size and number of bulkheads you have will determine the max flow rate of your return pump. The return pump chosen should not exceed the max flow rate of the overflow, if it does a bypass will need to be employed to maintain the equilibrium between the tank and the sump. 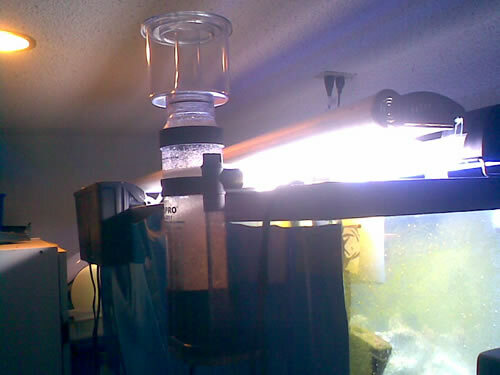 If setting up a refugium in your sump, then the flow rate of you sump should not be excessive. A refugium depends on lower flow, as this is the breeding ground for pods of all kinds and also the growth of your macro algae. The most important thing to provide for when choosing you sump is the size. When you determine the size of your sump you need to be sure it will hold all the extra water in the event of a power outage. The water from your tank will drain to the level of your overflow and that water needs to fit in the sump, failing to do this result in an unfortunate situation. Another consideration in the design of your sump is the location of the return pump. Return pumps can be either submersed or they can be run in-line. An in-line setup is generally preferable due to lower heat transfer. When your return pump is submersed in your sump the pump will transfer all of its heat to the water whereas with an in-line setup much of the heat is transferred to the air surrounding the pump. Your next piece of equipment will be the lighting. The type of setup you choose will determine this decision. If you are simply looking to do a FOWLR setup then you lighting will be a cheap purchase, as a simple fluorescent fixture will suffice. If, however, you are interested in keeping corals, you will need to look into the higher intensity lighting and the corresponding fixtures. There are 4 main types of high intensity lighting that are available to the reef hobbyist and we will discuss each of these looking at pros and cons. First there is Power Compact fluorescent lighting. The pros of Power Compacts are that they are inexpensive to operate, inexpensive to purchase and replacement bulbs can be purchased easily at a low price with a great variety of color temperatures available. The biggest downside to Power Compacts is that while they are intense lights, the do limit your choice of corals that can be kept. You will be limited to most soft corals and a number of Large Polyp Stony corals. Finally you should purchase a decent protein skimmer. Not considered an essential by some, a protein skimmer does remove a lot of things from the water that normal filtration does not. It will go a long way towards algae control in your tank. There are many different models available; some are hang-on-back while others operate in the sump. Here is a good example of a hang-on-back model skimmer. 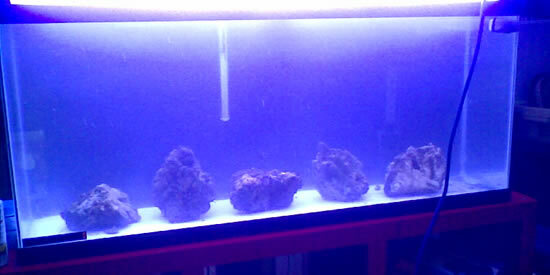 There are a number of other pieces of equipment that can be purchased but are not necessary for a basic reef tank. Now that the Equipment has been covered, it’s time to look at setting it all up. The first thing you need to do is choose the proper location for the tank, keeping it away from windows and heat sources are good ideas. Next, be sure your tank is level as an uneven tank can lead to some nasty surprises (i.e. Lots of water on the floor from a dislodged panel.) Leveling a tank can be achieved with the use of shims under the stand. Once the tank is setup it is a good idea to plumb your sump and fill the tank and test it with fresh water. This will help you find any leaks in the plumbing that may be there and will also indicate any unevenness in the tank. Once the tank has been tested for suitability for setup, it is ready for the water, rock and the sand. Fill the tank partially with saltwater. Your live rock should actually be placed in the tank before the sand so as to give it a solid base as seen in the following picture. Setting your live rock on top of the sand can allow for shifting later on and a subsequent toppling of the rock; needless to say, this can have dire consequences for corals, fish, and the tank. Once the rock is in, add the sand around the base, don’t worry if the upper levels of rock are not exactly where you want them, you can fix this at any time, just be sure the base pieces are right where you want them before adding the sand. Now it’s time to finish filling the tank. You should have already had water mixing for this purpose, if not, it is possible to mix it in the sump and pump it directly to the tank. Since the live rock has been exposed to the air for some time there will be a certain amount of die-off and this will create the needed ammonia to get the cycle going. No fish should be added to your marine tank during the cycle. In about 4-6 weeks you will have a fully cycled tank ready to accept it’s first inhabitants. The first additions should probably be a cleanup crew if it is to be a reef tank. If a FOWLR tank is to be maintained with more predatory species, the first of these species can now be added. Be sure to add things slowly so as not to throw the tank into another cycle. You will experience a series of algae outbreaks, but do not be disheartened, as these are completely normal, just unsightly for a little while. Congratulations, you have now successfully setup your marine tank. Sit back and enjoy the beauty that is before you and remember, keep up with those water changes.